Weezer return with their newest proper outing since 2017's 'Pacific Daydream' (aside from the 'Teal Album', a covers LP from earlier this year). 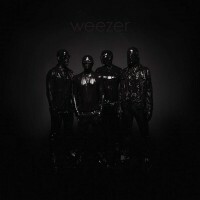 Sporting the trademark Cuomo riffs and smooth punky two-chord battery, Weezer have never failed to write anthemic, catchy pop songs and the black album is no different. Perfectly produced and brilliantly written, this continues to show that the band remain as relevant today as they ever have. Full of an indeterminate amount of riffs and imbued with an energy few bands can fathom after being around for so long. Classic Weezer. 3. "High As A Kite"
6. "I'm Just Being Honest"
7. "Too Many Thoughts In My Head"
8. "The Prince Who Wanted Everything"